The border with Rwanda is open from 6am until 10 pm every day. Some of the best search engines for cheap flights are Momondo, Ita Matrix, Swoodoo, Kayak, Vayama, Opodo, Travelpapa, Expedia, and Priceline. There are several flights from many towns of Congo to Goma. There is a daily flight from Kinshasa to Goma which is operated by CAA (for more see section ‘Get around’. Alternatively, it is possible to fly to Kigali -in neighboring Rwanda- by direct flights from Europe (France, Belgium, Germany), then by road to Goma. From Kigali-Goma, you can take either a taxi for $80 (even though they will first try to charge you $100) or a collective bus for $5. Taxi drivers include: +250 784 656 676; +250 788 699 510, +250 735 563 780, shemabond@yahoo.fr. 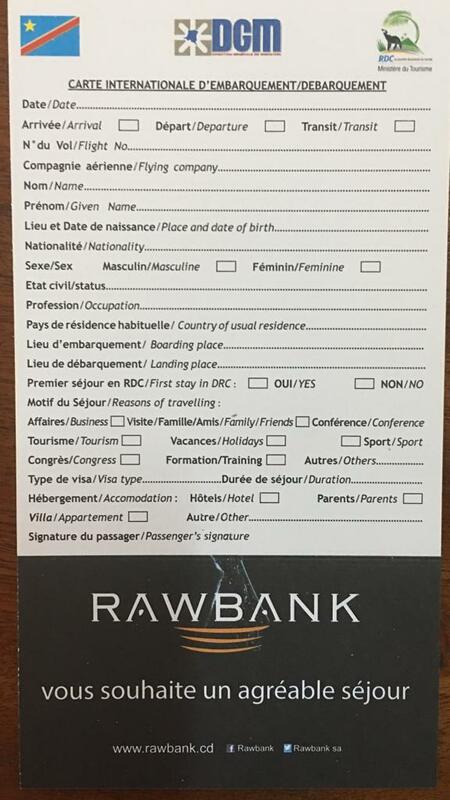 Upon arriving in Goma by plane, you’ll need to fill out the following form. From Kisoro, Uganda, you can take a minibus in Bunagana at the Uganda border but it’s currently too dangerous from there to go further south to Goma. From Rwanda there are hourly minibuses from Kigali to Goma, such as Atraco Express and Okapi Car. These will take approximately three and a half hours. From Butembo you can fund a bus from Butembo bus station. They may leave early in the morning. There are daily ferries from Bukavu via Idjwi Island. There are several companies that offer the 2-5 hour trip. Prices vary from 10$ to 50$. For more, see here. Great website…I’ll be coming to Goma from Kigali in a couple weeks. What’s the approximate cost for a one-way bus ticket from Atraco Express from Kigali to Goma? I will travel by minibus from kigali to goma tomorrow and will finally answer this question better late then never!